Before recycling a plastic container that once held food, get the container as clean and dry as possible. 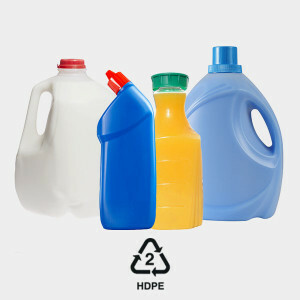 Containers that contain recycling contaminants like food are often separated out and sent to a landfill. Recycle hair care, skin care and cosmetic product packaging through this free mail-in program by TerraCycle and Garnier. Accepted items include shampoo caps, conditioner caps, hair gel tubes and caps, hair spray triggers, soap dispensers and tubes, body wash caps, and lotion dispensers and caps. Find out more. Plastic #2 can be recycled into new plastic jugs, plastic lumber, patio furniture, flower pots, buckets, recycling bins, benches and fencing.